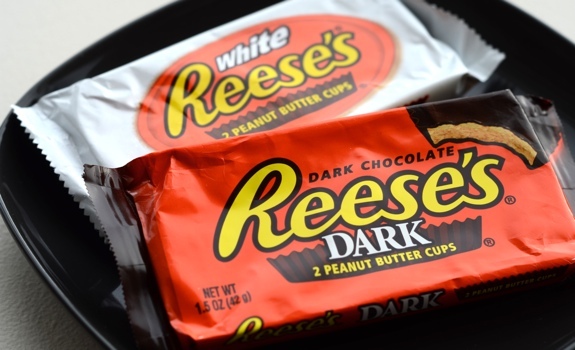 Reese’s White and Dark Chocolate Peanut Butter Cups, purchased in the U.S. and consumed in Canada. I’ve tried a whole pile of different Reese’s products in the past, from various bar-form treats to cereal to tubs of peanut butter, but I’d never seen Reese’s Dark Chocolate and Reese’s White Chocolate peanut butter cups until a trip to Seattle late last fall. So? How do they compare to the regular Reese’s peanut butter cups? Dark Chocolate: Very similar to the milk chocolate original. The dark chocolate marginally ups the bitterness. A bit more astringent, too, with a more dominant cocoa taste. Is the chocolate a tad more fruity? That’s what I’m getting from it, anyhow. White Chocolate: Really nice. 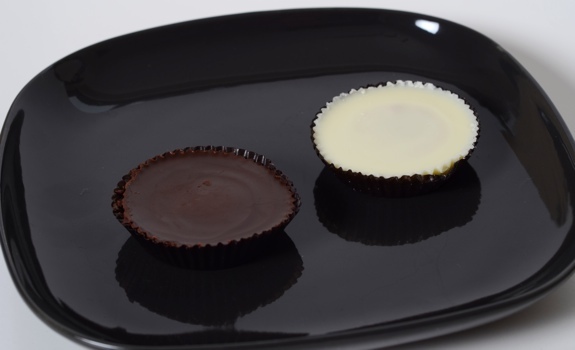 Whereas the dark chocolate peanut butter cup is only subtly different, the white chocolate version adds a whole new set of flavours. Rich, sweet, creamy. Pairs beautifully with the peanut butter. I didn’t think it would be this good. Quick conclusion: Of the two, I’d pick the white chocolate. But neither one is better than the original milk chocolate. A partially consumed Reese’s White Chocolate Peanut Butter Cup. It didn't last long. Cost: Varies. I paid $0.89 for a two-cup (1.5 oz., 42 grams) package of dark chocolate peanut butter cups at Walgreens in Seattle, and $0.50 on sale for the white chocolate ones at QFC. Nutrition? : Roughly the same as regular Reese’s peanut butter cups. 210 calories per two-pack of dark cups (so, 105 per cup), and 220 calories per two-pack of white cups (110 per cup). Lots of sugar and fat, with a nice hit of protein. The verdict: Worthy additions to the peanut butter cup family. Reese’s White and Dark Chocolate Peanut Butter Cups. Can you tell which one is which? Blow my mind! 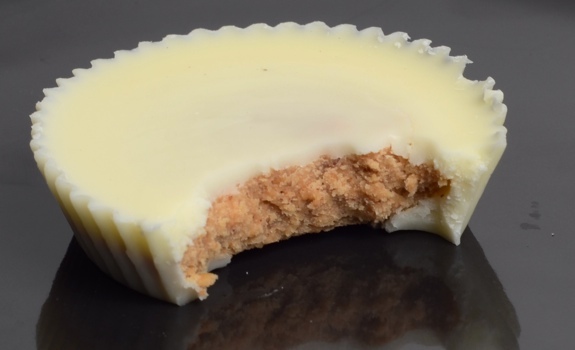 White chocolate pb cups! Why can’t we get these!! I know! They’re very good. A lot of folks aren’t big on white chocolate, but it works well with the salty, creamy peanut butter filling. Lord knows I’ll be eating more of these on my next trip to the States. I agree completely, milk choc best, then white then dark. BUT I LOVE THEM ALL! When it comes to PB cups, it’s hard to pick a favourite. Still, if I somehow get to the U.S. this summer, I reckon a few white chocolate Reese’s Cups will follow me home.